Watching a documentary on Amicus Productions. Good stuff. It's apparently your responsibility as a Steam user that people are being dicks on the internet. It's a messy scattershot of an article, but I think his point is that Steam is not doing a good enough job of moderating its community, so he's dropping them and he suggests we foster alternatives so we're not stuck with only them. There's nothing incorrect about the opinion that you can and should expect more from Valve, but it's written from the high horse angle that I really loathe. Even more so when the author adds a late disclaimer that he doesn't really care about either his Steam games or PC games in general, but wants you to decide what kind of person you want to be. I consider myself to be a pretty descent person in general, and I act against the things I encounter that I find to be wrong. But I spend time with games to enjoy the creativity I find in them, not to engage in every battle that happens to take place with gaming communities. I leave postive remarks and upvote good reviews for games I enjoy and developers I respect, but I'm not going to limit my access to games I want because of what other people do. I think Steam really needs to start engaging community moderators. Find prolific users who would represent the company well, promote them to moderators, use that team to clean up the forums. Does he expect people to give up their citizenship to a government that does bad things or tolerates other citizens who do bad things as well? Any large and complex organization is gonna be plagued by bad elements to one degree or another. Yes Valve should police its communities better but that's easier said than done. In the meantime you aren't morally superior for denying yourself a service you don't even care about or benefit that much from. I have 500+ Steam games and a PC built specifically for running them. Steam as a platform exists to manage my games library with the community being an extremely small part of that service as I use it. I won't throw away thousands of dollars of investment just because some dummy thinks it makes me a terrible person. Spaff talked on twitter how he does the moderation of the Steam forums and the ways in which Valve's moderating tools are lacking, so that's one aspect they should work on. Totally agree with that. Valve have been lacking in many departments. And if too little gets done with tools like that, because their "we only works on what interests the employees" is the reason for that, then they need to hire a bunch of different people on top of what they have. The one good advice the author has is that you should spread your business and buy games from other store that you want to encourage. Unfortunately for me, that only means GOG, Humble and directly from devs. I don't see buying games from Origin, uPlay or the Windows Store doing anything good for me, because they're not want I want. I should have a look at itch.io, but haven't done that yet. Yep. If GOG was as big as Steam, they would be faced with the same problems. And while one can speculate that they might have handled things differently, there's little reason to believe that it would have been perfect, based on that pretty much all big community platforms have problems with issues like this today. And I'm not running away from either Facebook or Youtube because of what other people are doing there either. The review bombing of Firewatch is sad to see, both out of a general perspective and from a personal one, with Firewatch being a game that I hold in very high regard. But it's the same there, with review bombing being a thing on metacritic, amazon, IMDB, etc. And even if Valve haven't taken enough steps to counter it, the fact is that they have done something, with separating overall and recent aggregates, letting people upvote and downvote (something I use for all games I like that I feel need help) and more things coming to see scores fluctuation over time. Which developer memes are better? 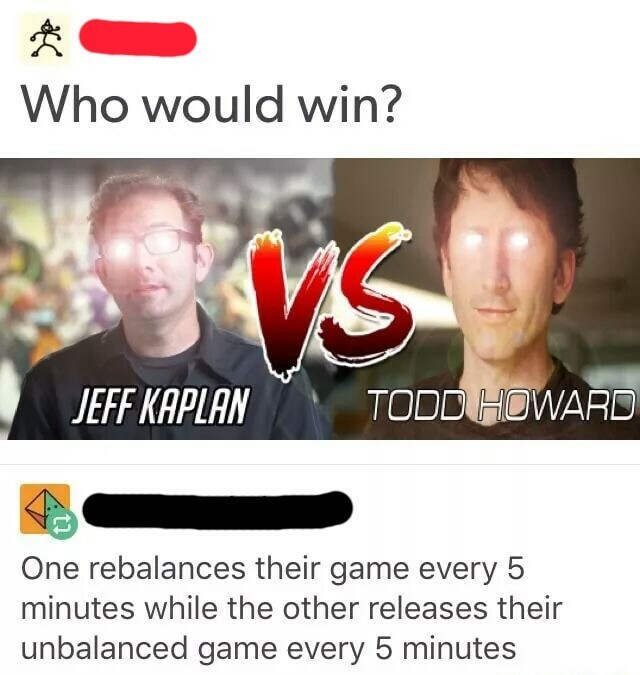 Gabe Newell or Todd Howard? Well we clearly know which one your prefer. Also Jeff Kaplan is the best developer meme, duh. Edited September 18, 2017 by Tiny Dust! Well, Gaben memes were the big deal back in the late 00s and early 10s, but got replaced by the Todd memes when Skyrim kept getting re-released all the time. Yeah both of those are boring, Jeff Kaplan memes are actually good, and come from a place of genuine affection. Exactly! OMG the Jeff part of the joke is infinitely funnier. Wrestle with Jeff! Prepare for death! First time a saw this poster today it was paired with a headline about the impossible length of Lara's neck and I cannot unsee it. Looking forward to a photoshop fail free trailer tomorrow. This is happening and I am very excited. I look at this and imagine that lady giving he psycho behind her a withering glare and he just puts down the knife and mumbles "Sorry, Mrs. Anderson." Discounting the Rob Zombie duology and Season of the Witch, the Halloween series follows separate timelines. From what I've gathered so far, David Gordon Green and Danny McBride are planning on doing another retcon where Laurie Strode is no longer Michael's sister. I'm fine with Michael just being a deranged psychopath projecting the image of Judith Myers and her irresponsibility onto everyone he kills. Would anyone mind if I pulled out the Firewatch/Pewdiepie/Steam bombing from here and the Telltale thread and merged it into a new thread? It's super confusing as it is, since the same discussion is happening in both threads. I'd be happier if the whole thing was just bombed period. Frank Miller is doing a prequel to 300 from the POV of the Persians. After Dark Knight III, I'm okay with this. After the last 3 movies, I'm not really excited about any more. Hey, go for it though. That's kind of my motto about sequels and remakes. Although I enjoyed it, I think H20 suffered by being part of the Scream era of self aware 'hip' horror. There's a few problems I have with it such as LL Cool J's misplaced character, a lack of characters to invest in besides Laurie Strode and forced visual references to the first two, but my biggest is how they constantly showed Michael Myers in full light. It ends with Laurie chopping Michael's head off. That was pretty badass. And no, I don't count Resurrection. %#$@&! a Halloween without Laurie Strode, and %#$@&! a Halloween where they unceremoniously kill her off in the opening of the movie. Agreed. Resurrection was a great big steaming pile of monkey s**t, right down to the insufferable Tyra Banks and Busta Rhymes.